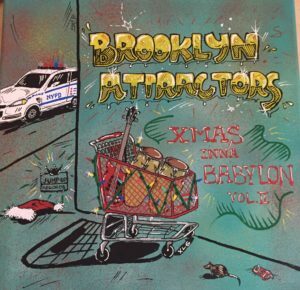 Our annual tradition of feeding the Christmas spirit in ska/reggae style continues! 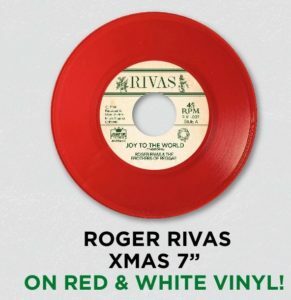 THE AGGROLITES’ keyboard wizard ROGER RIVAS needs to introduction – here he returns with two instrumental hot shots of early/skinhead reggae – “Joy To The World” and “Winter Wonderland” will melt the snow off the rooftop! 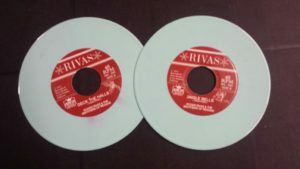 Limited to 300 copies, 150 on white 150 on red. We’ve still got some of ROGER RIVAS’ last Christmas 7″ single last holiday ” single – instrumental organ drenched reggae versions of “Deck The Halls” and “Jingle Bells” – but act fast there’s less than 20! 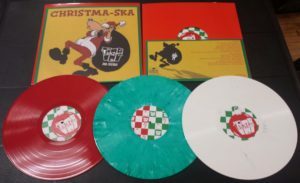 Christmas Ska! LEO & THE LINE UP / NAPOLEON SOLO split 7″ single – Danish Dynamite! 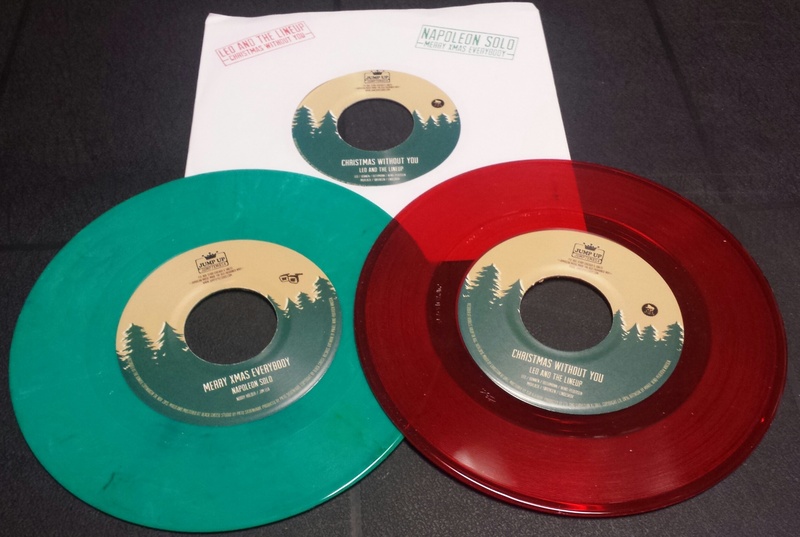 Last year’s Christmas 7″ single is back in stock! We are SO PROUD of this record!! In the late 80’s there were a handful of bands across the world that kept the ska flame alive, one of our favorites was NAPOLEON SOLO from Denmark. An amazing soul/ska band, keeping the 2-TONE flame with modernist vibe, their first mini-LP “HOW TO STEAL THE WORLD” on UNICORN is still a stone cold classic to this day! 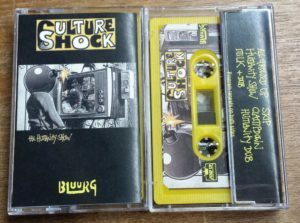 They’ve been at it for over 30 years, but haven’t released a new record since the early 90’s. LEO & THE LINE UP are also from Denmark – they’ve become one of the hottest ska bands in Europe with releases on PORK PIE, GROVER, and of course JUMP UP. 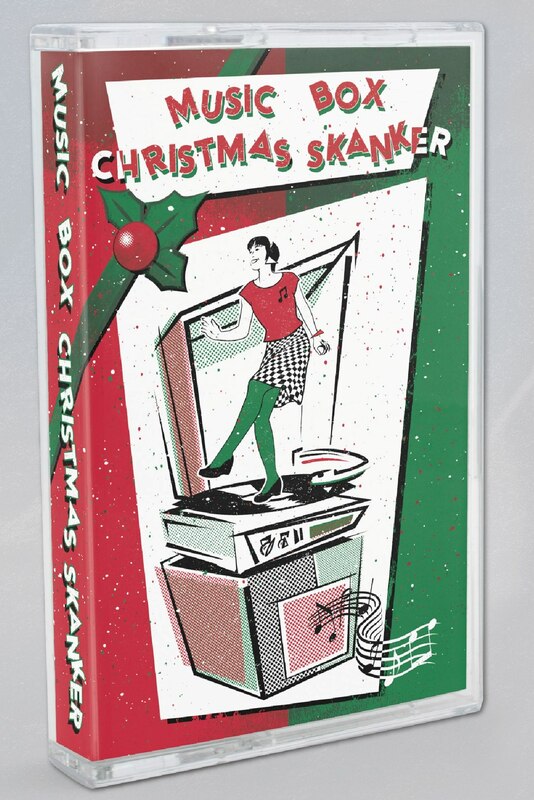 An amazing soul ska band with three amazing female back up singers – it just made sense to unite the two on this Christmas vinyl single! DANISH DYNAMITE BABY! LEO & THE LINEUP penned a new holiday classic “CHRISTMAS WITHOUT YOU” while NAPOLEON SOLO covers the classic “MERRY XMAS EVERYBODY”. Limited edition of 500, available on RED and GREEN vinyl. 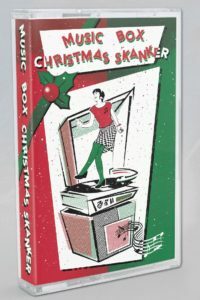 Our yearly tradition of releasing Christmas ska/reggae wax continues into it’s 6th straight year! 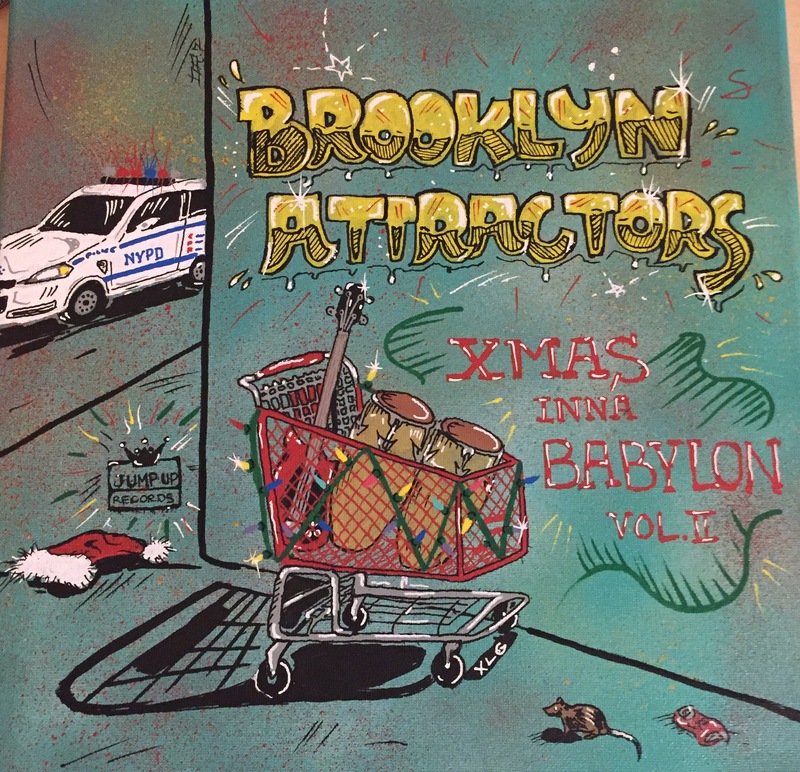 BROOKLYN ATTRACTORS have returned with two killer jazz-reggae nuggets for your holiday pleasure: “Ras Nick” and “Upon The Housetop”. This all star band features Eddie Ocampo-drums / Bid Dan Jeselsohn-bass / Andy Bassford-lead guitar / Matt Kursmark-rhythm guitar / Mike Sarason-piano and Rhodes / Larry McDonald-percussion / Anant Pradhan-alto/tenor saxophones and Bansuri flute / Luke Penella-flute and tenor saxophone / Philip Cooper-trombone / Rich Graiko-trumpet. 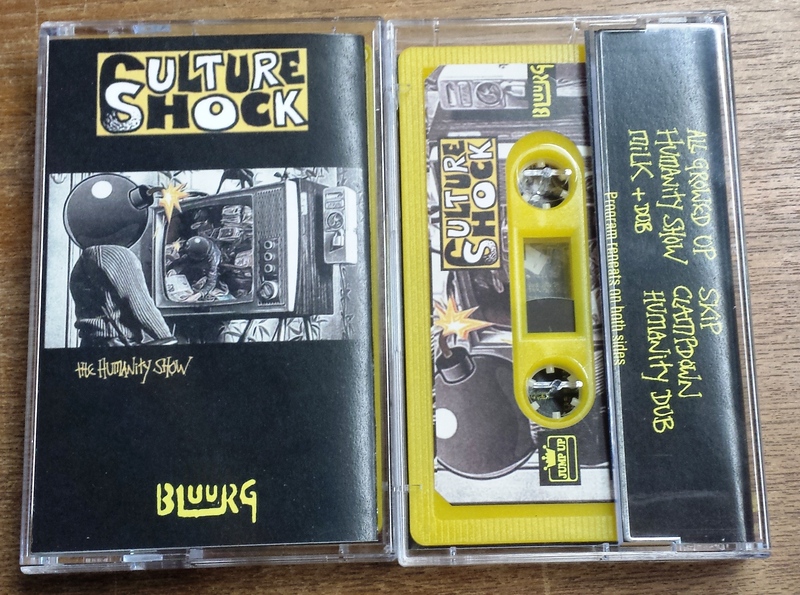 This year’s new 7″ single has an added special treat – cover artwork painted by Danny Rebel. Limited to 200 copies, 100 on green and 100 on red. Merry Christmas & Happy Holidays from all of us at JUMP UP RECORDS! Last year we re-released the legendary CHRISTMA-SKA album on vinyl for the first time ever, and it was a huge hit with the entire pressing selling out in less than 3 weeks! Good news – we’ve re-pressed it again this year on marbled red vinyl. You’re asking yourself…wait… why didn’t I have this MOON SKA NYC CD in my collection back in the day? 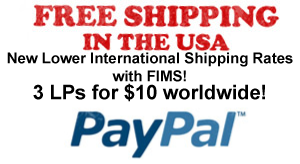 Well here’s why….this amazing holiday collection was licensed from MOON SKA to a Japanese company in 1997 – unless you were forking up the big bucks for an import copy it probably wasn’t on your radar. To top it off, the Japanese label ceased operations soon after and this CD became a true rarity!